Pasta, pizza, pannacotta – just thinking about Italian cuisine makes your mouth water. We’ve all come to know and love various Italian dishes and it’s safe to say that not a week goes by without a little taste of Italy. Italian food is famous worldwide for its incredible taste that just makes you come back for more. But what exactly is their secret? What makes Italian food so phenomenal? We dug deeper into the magical world of Italian cuisine. You could say that the greatness of the food is largely dependant on how long is the history behind that cuisine. Italians were on to something great as early as the 4th century BCE. Around that time, an ancient Greek poet Archestratus spoke of using high-quality seasonal ingredients and even referred to how food’s natural flavors shouldn’t be overshadowed by seasonings. These truths, as old as they may be, still apply to modern Italian cuisine. Ancient Rome was almost infamous for its love for food and dining. A huge part of Roman social life was directed on dinner parties, known as convivium. The main ingredients that were used most prominently, even on feasts and banquets, were simple: grains, wine, meat and fish and sauces and spices. Olive oil was fundamental in their lifestyle, the same goes for milk and cheese. Italian cuisine has stood against the sands of time successfully and largely in the same form, making it clear that one essential part of Italian cuisine is its simplicity. There’s a big difference between fresh tomatoes and canned tomatoes – and naturally, Italians prefer the first option. One of the reasons Italian food might taste superior to other cuisines is the freshness factor. Italians grow their herbs themselves and tend to buy vegetables from a local farmer’s market where only the freshest and most carefully picked out veggies are found. Nothing is mass-produced, everything is grown with love, right from the seed. The beauty of Italian cuisine lies in natural flavors being brought out and combined together. The sourness of tomatoes is not washed down with sugar, instead, it’s complemented with herbs like basil that adds a little oomph to the sauce. The desserts are not overly sugary, but fruity and creamy as the natural foods are shining in their finest form. To bring that beauty to your own kitchen, ditch processed food and don’t even look at ready-made sauces. Make everything from scratch from fresh produce and fresh flavors – that’s the Italian way. There’s no pizza without the sauce. There’s no bolognese without the sauce. 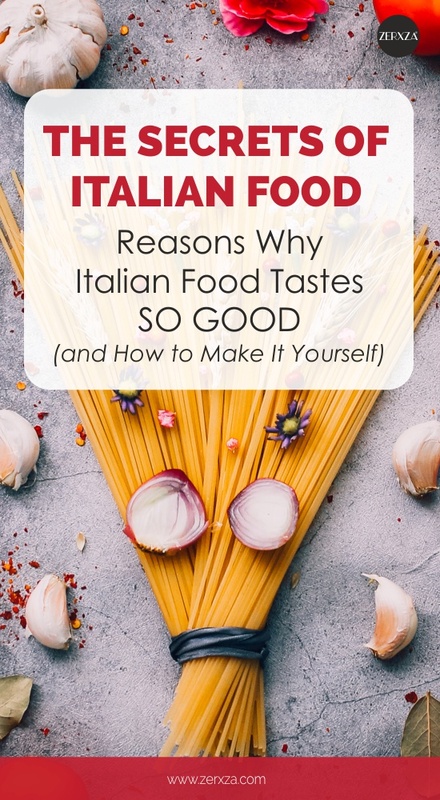 There are literally hundreds of different sauces in the Italian cuisine, many being seemingly very similar, but completely different in their taste. Different regions have variations of the base sauces and so the complex and fascinating world of Italian sauces is born. The main flavors in Italian cuisine are found in the sauce. In addition to using meat or tomatoes prominently, many Italian sauces contain various herbs and seasonings, starting from evergreen options garlic and pepper, ending with freshly picked basil and oregano. Besides using herbs and seasonings, one of the secrets to making the perfect Italian sauce is cooking it at the right temperature (and for the right time period). When exploring the Italian cuisine further, you might realize how an authentic sauce can take as much as a few hours of simmering on low heat. Sometimes, making Italian sauces can seem as delicate as creating a piece of art! There’s no room for rushing or “throwing ingredients together” – each ingredient is carefully picked out and added to the mix at the right time, so the flavors could blend together perfectly, creating the wonderful flavor palate of your favorite Italian dishes. While sauce is one of the most crucial parts, there’s another part that seems so simple, but in reality can be tough to nail: pasta. Don’t add oil to the water – many still believe that oil is the key to keeping pasta from sticking, but the actual key is just using more water. Using the oil can prevent the sauce from imbuing to pasta, so it really pays off to stop using oil in the pasta water. Don’t use a random pasta with a random sauce – this is similar to using the right wine with the right meat. Same goes for pasta. Different types of pasta have different properties which make all the difference when it comes to how the sauce interacts with pasta. Add pasta to the sauce, not the other way around – to mix the flavors together perfectly, don’t just add a spoonful of sauce on top of the mound of pasta. Instead, add the pasta to the saucepan while you’re still cooking. This way, the flavors can imbue together to create a wonderful explosion of flavors. Don’t be afraid to cook the pasta less than shown on the package – when you add the pasta to the saucepan, the sauce’s hot temperature itself will slightly “cook” the pasta. Therefore, you really shouldn’t add soft pasta to the sauce as it will turn mushy in the end. Instead, cook the pasta to al dente or very close to it. Use a big pot and tons of water to cook the pasta – pasta needs space to avoid from sticking together. One liter of water per hundred grams of pasta is a nice average number that seems to work well for most kinds of pasta. One aspect that remains the same throughout Italian cuisine is its simplicity: the ingredients are simple and so are the techniques. What matters the most is putting love to the food preparation. Pick out your ingredients with love and only opt for fresh products. Give the sauce all of your attention and boil the pasta with care. Italian dishes are actually incredibly easy once you adopt the Italian cuisine mindset: only fresh and only the best.